next architetti d.r.l is an “expanded” design workshop that makes use of art, architecture, ideas and the realities of economics and management to deal with the themes and nodes of contemporary culture. next is the creation of Elisabetta Avallone, Giulio Forte, Simone Orsi, Gabriele Pierluisi and Andrea Sciolari, all of whom live and work in Rome. Their professional practice and research deals primarily with the image and structure of the contemporary city, architectural design and urban and spatial planning. 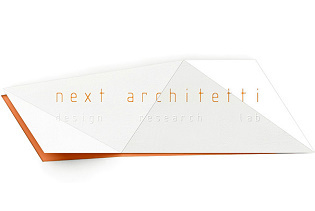 next architetti d.r.l is a network of specialists in architecture and parallel disciplines who work on the expansion of the logical-conceptual structure that presides over the organisation of architecture and the extension of its operative domain in derivations and drifts towards and from other disciplinary environments.